The Washington Capitals came out with a bit more urgency in their second preseason game. Out shooting the Blue Jackets in their home preseason opener 6-1, the Capitals looked like they might have found an offensive groove. But some flubs on special teams again confound the Caps and they fail to complete the comeback in overtime to lose 4-3. Jeff Halpern started things off with almost a lucky bank shot off of Columbus' goaltender Steve Mason for the early lead. The BJs scored three straight and took a 3-1 lead into the midway point of the final period. After Columbus scored early in the third, Andrew Carroll got into a scrap and later would cut the BJ lead to one with a garbage goal. Roman Hamrlik scored just over a minute and half later through heavy traffic in front of the net pushing the game into overtime. Jeff Schultz, of all people, took a hooking call trying to reign in Rick Nash and the BJs win on a power play goal scored by Alexandre Giroux (former Hershey Bear/Washington Capital property). Again, special teams hindered the Capitals as the power play went 0-4 and allowed a shorthanded goal in the second period that made the game 2-1. The Caps penalty kill was okay, but did allow the game winning goal in OT. The Capitals still have not found the magic bullet with the extra man. A luxury they had prior to the last season was a solid power play to put teams on their heels. While it is still preseason, there is the feel of "Oh, this again" when it comes to special teams. The Capitals are able to play tight 5 on 5, which can only benefit from a good power play that will keep the opposition honest at even strength. The Blue Jackets scored a goal in every period. Washington will finish the game out shooting their opponent 30-24. Halpern was a stand out for the Capitals scoring a goal and getting an assist to finish a +2. Hamrlik had a goal and assist himself. Matt Hendricks played well, getting and Jay Beagle was the only other Cap to finish with a +2. Chris Bourque did play his best as he finished with a -2. Braden Holtby made some great saves only allowing 2 goals after being pulled after the second period. He faced 14 shots and finished the game with a respectable .857 save percentage. Philipp Grubauer finished the game in the third period. 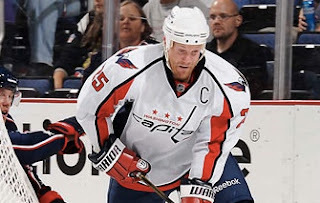 Jason Chimera returned to Columbus wearing the captain's "C" on his jersey in the absence of Alex Ovechkin who got the night off.